As the lady’s glove faces retirement after 20 years of use, sound artist and performer Laetitia Sonami explores a new instrument, and new relations to performance. Sonami will present three manifestations of her Spring Spyre, a mutable instrument where the movement of chaotic springs are analyzed via neural networks to control the audio synthesis in real time. OCCAM IX was composed for Sonami by her mentor Eliane Radigue. 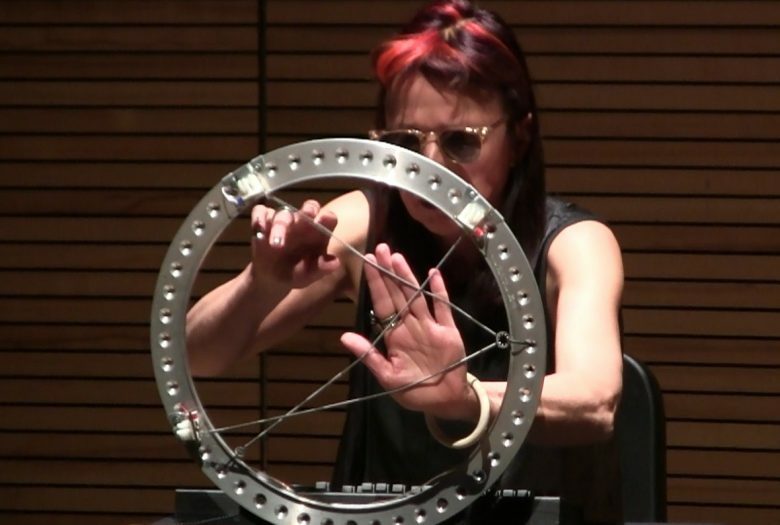 Radigue’s latest composition inscribes itself in her OCCAM series based on collaborations with instrumentalists and composers (more info on OCCAM). SPARROWS and ORTOLANS is an improvisation duet with James Fei. After baking together, Sonami and Fei ventured on improvising and exploring the chaotic nature of their instruments. What Happened X is a revival of Sonami’s 1982 piece, with a text by Melody Sumner Carnahan, now adapted to the Spring Spyre, in memory of Robert Ashley. Laetitia Sonami was born in France and settled in the United States in 1975 to pursue her interest in live electronic music. She studied with Eliane Radigue, Joel Chadabe, Robert Ashley and David Behrman. Sonami’s sound performances, live-film collaborations and sound installations focus on issues of presence and participation. She has devised new gestural controllers for performance and applies new technologies and appropriated media to achieve an expression of immediacy through sound, place and objects. Recent projects include Spring Spyre – an unpredictable controller for live performance, Sound Gates a public sound installation on a 2.5 km pier in Rijeka, Croatia and Sheepwoman , a live film in collaboration with SUE-C, based on a Murakami novel. Sonami has received numerous awards among which the Herb Alpert Awards in the Arts and the Foundation for Contemporary Performance Awards. She currently is visiting faculty at the San Francisco Art Institute, Mills College and Bard College MFA summer program. Eliane Radigue started her electronic music career in the 1950s. A student of Pierre Schaeffer, she later became assistant to Pierre Henry. Eliane first started exploring pieces using feedback techniques and later adopted the ARP 2500 modular system which she used as her instrument for more than 30 years. In 2000 she created her last piece for the APR and tape, L’Ile Re-Sonante, for which she received the Ars Electronica Golden Nica. Since 2001 she has composed mostly for acoustic instruments. Major works include Geerliande, Adnos, Jestun Mila, Trilogie de la Mort, Naldjorlak and the more recent OCCAM series. James Fei moved to the US in 1992 to study electrical engineering. He has since been active as a composer and performer on saxophones and live electronics. Works by Fei have been performed by the Bang on a Can All-Stars, Orchestra of the S.E.M. Ensemble,MATA Micro Orchestra and Noord-Hollands Philharmonisch Orkest. Recordings can be found onLeo Records, Improvised Music from Japan, CRI, Krabbesholm and Organized Sound. Compositions for Fei’s own ensemble of four alto saxophones focus on physical processes ofsaliva, fatigue, reeds crippled by cuts and the threshold of audible sound production, while his sound installations and performance on live electronics often focus on electronic and acousticfeedback. Since 2006 Fei has taught at Mills College in Oakland, where he is Associate Professor of Electronic Arts.